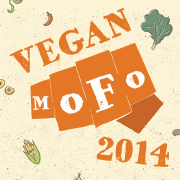 Welcome to another day of VeganMoFo, the month of vegan food. 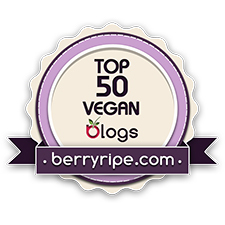 VeganMoFo is when bloggers all over the world dedicate their time and their blogs to posts about vegan food every day of the month. 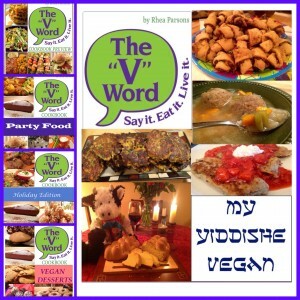 This month The “V” Word is concentrating on vegan products that are worth writing about, reading about, buying, trying and spreading the word about. 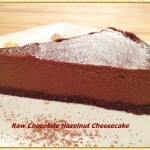 And if any products inspire new recipes, I will share that too! 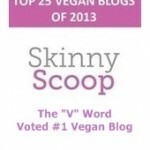 Today that is definitely the case as today’s product, Beyond Meat, inspires tons of recipes. 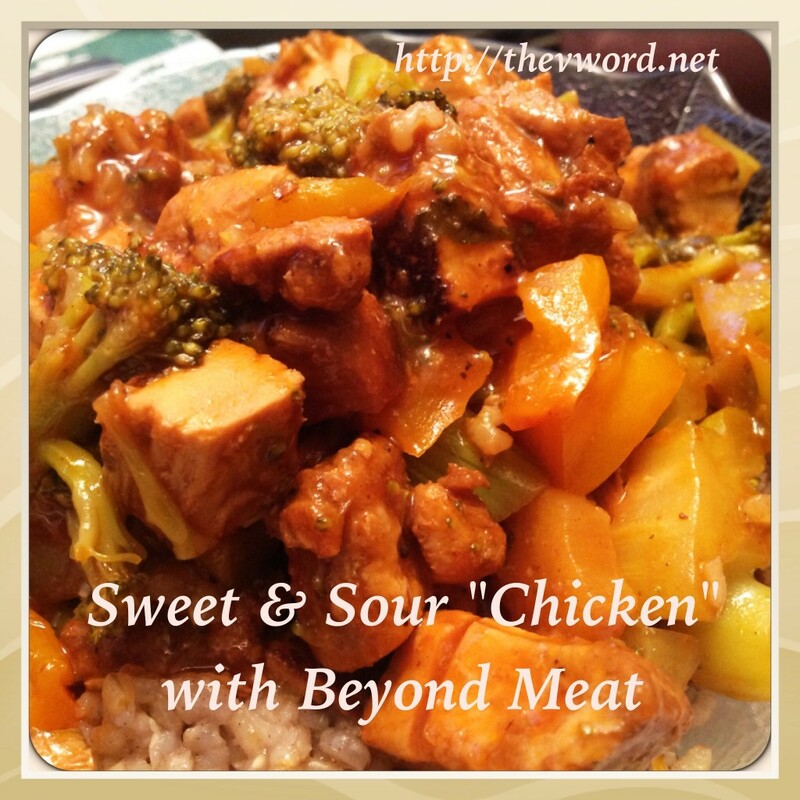 I have been a fan of Beyond Meat’s Chicken-Free Strips since they first came onto the market. 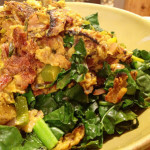 In fact, I did a review of them last summer and made some incredible dishes. 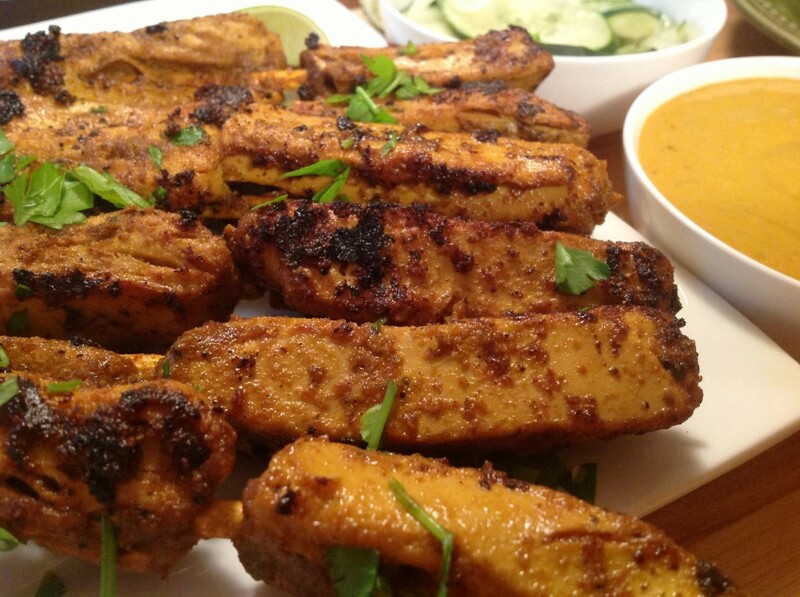 In that review, I shared the recipe for my Beyond Meat Chicken-Free Satay with Peanut Dipping Sauce. 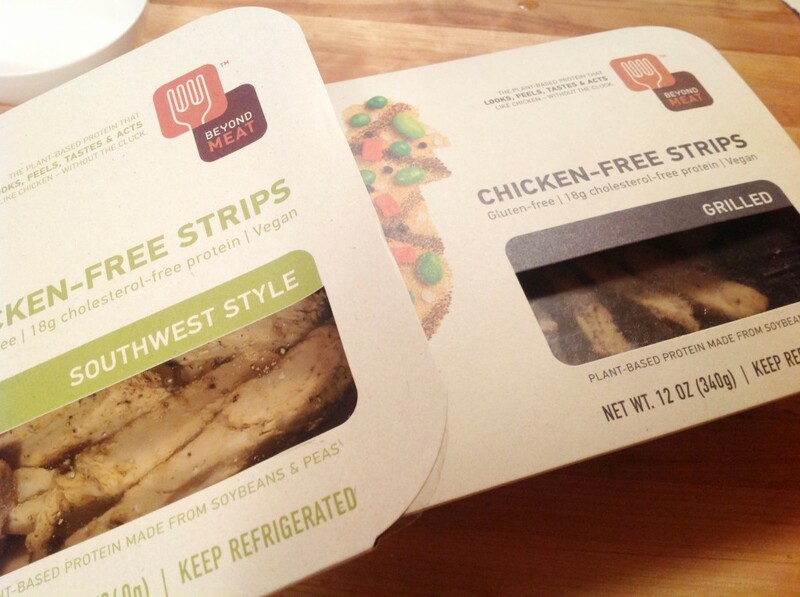 Since then I have made many dishes with Beyond Meat’s Chicken-Free Strips. 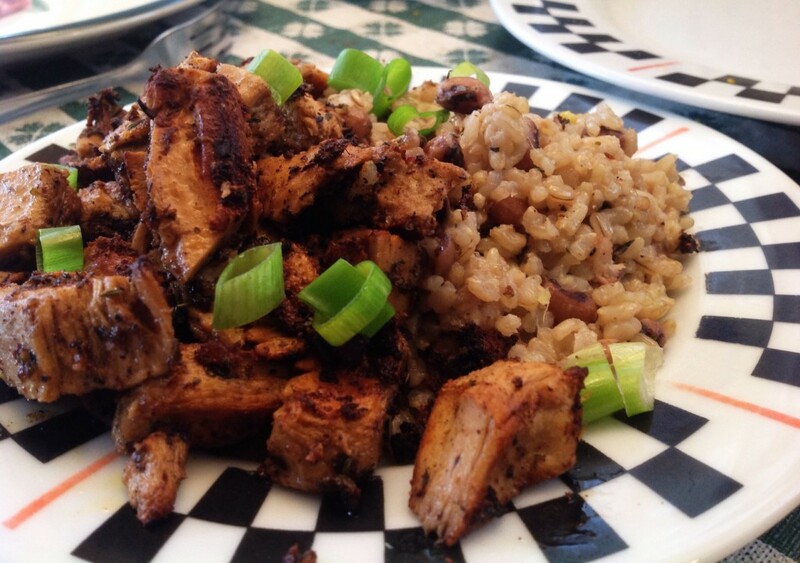 After all, chicken was the food I thought I couldn’t live without and Beyond Meat makes it so easy to do just that. You get the idea. 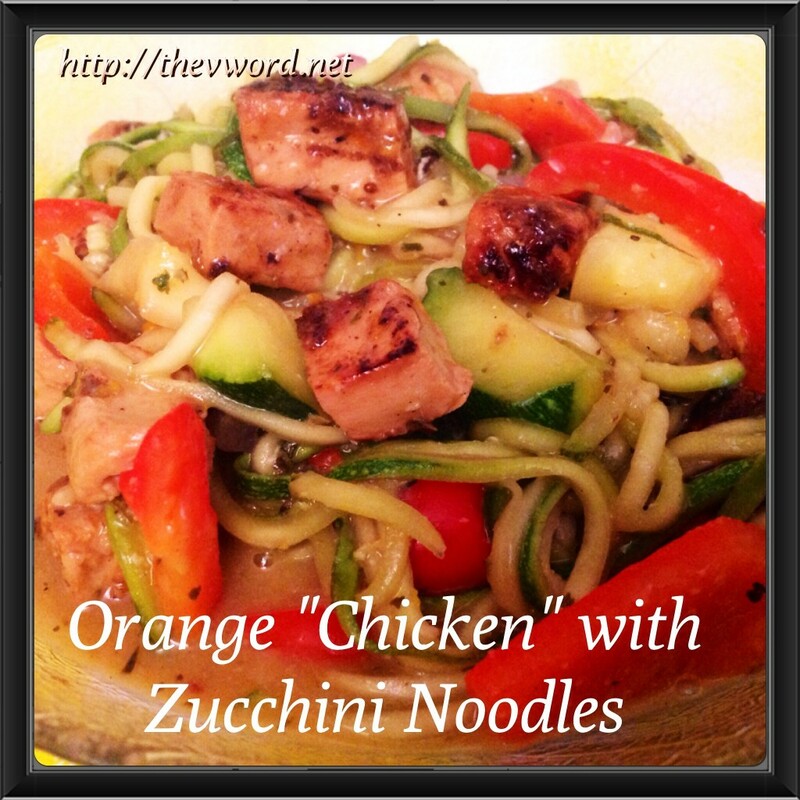 If I want to make a “chicken” dish, I either use tofu or Beyond Meat Chicken-Free Strips. 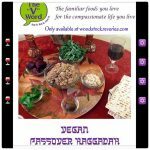 While I am anxiously awaiting the release of Beyond Meat’s burgers (yes, they are coming out with burgers! 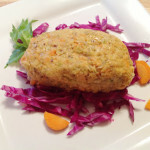 ), I thought I would share yet another “chicken” recipe made with Beyond Meat Chicken-Free Strips. 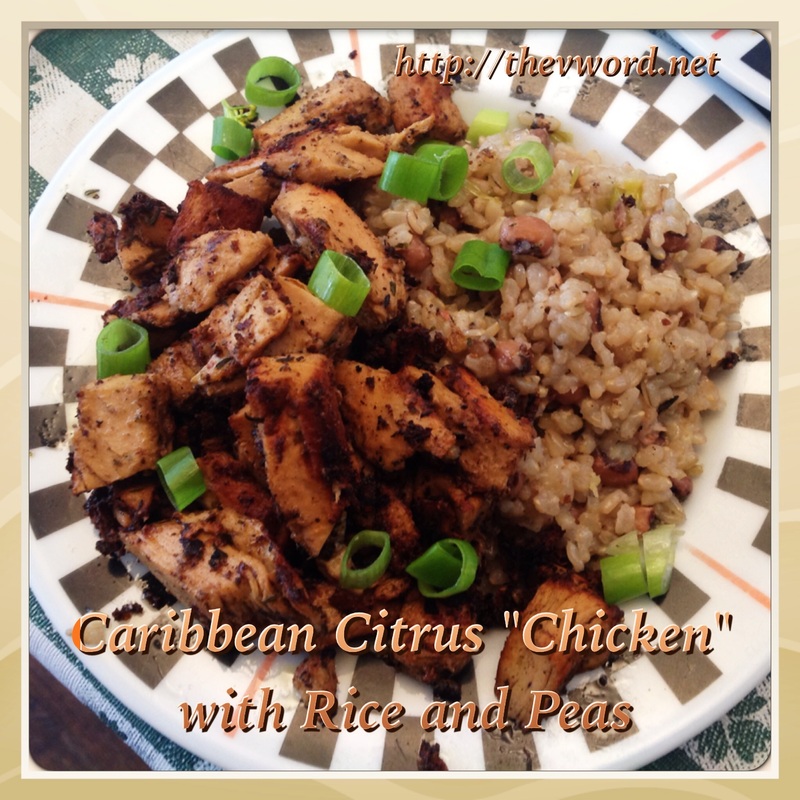 This one is my Caribbean Citrus “Chicken” that I serve with my Jamaican Rice and Peas. 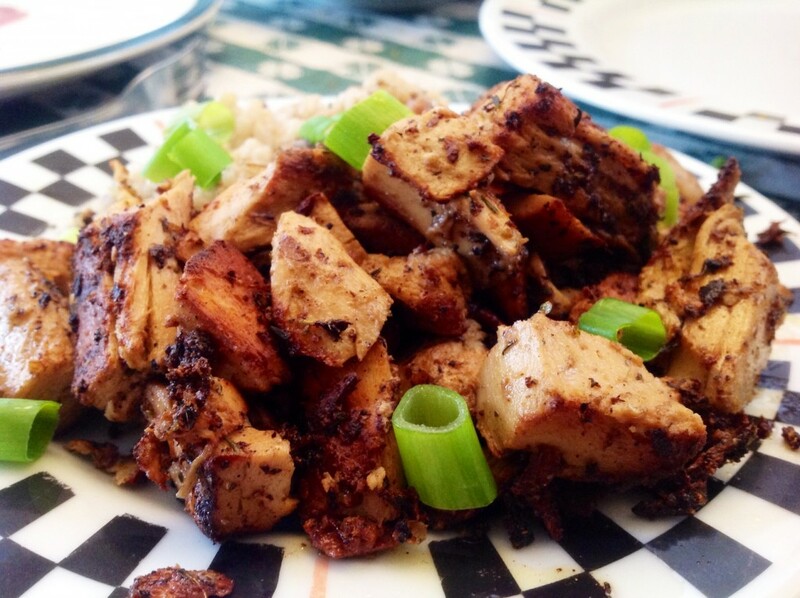 Beyond Meat Chicken-Free Strips are marinated in fresh orange and lime juice, tamari, olive oil, hot sauce, garlic, ginger, oregano, thyme and allspice. Then the “chicken” is cooked in coconut oil until it’s browned and crispy. It’s amazing! 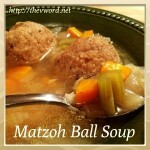 I know this is one of my favorite dishes because I make it over and over again. And in the sad, unfortunate case when I don’t have any Beyond Meat in the fridge (GASP! ), I make it with tofu. 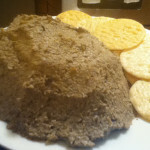 It can also be made with tempeh or seitan. But if you can have it with Beyond Meat, why wouldn’t you? 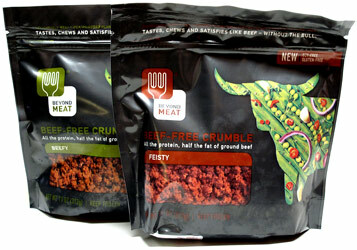 Check out the Beyond Meat web site for find about more about their Chicken-Free Strips and their Beef-Free Crumbles in Beefy and Feisty. Use the store locator to find out where they sell Beyond Meat near you and download a trial coupon. Also check out the BYMT Shop where you can buy t-shirts, caps, key chains, and buttons. 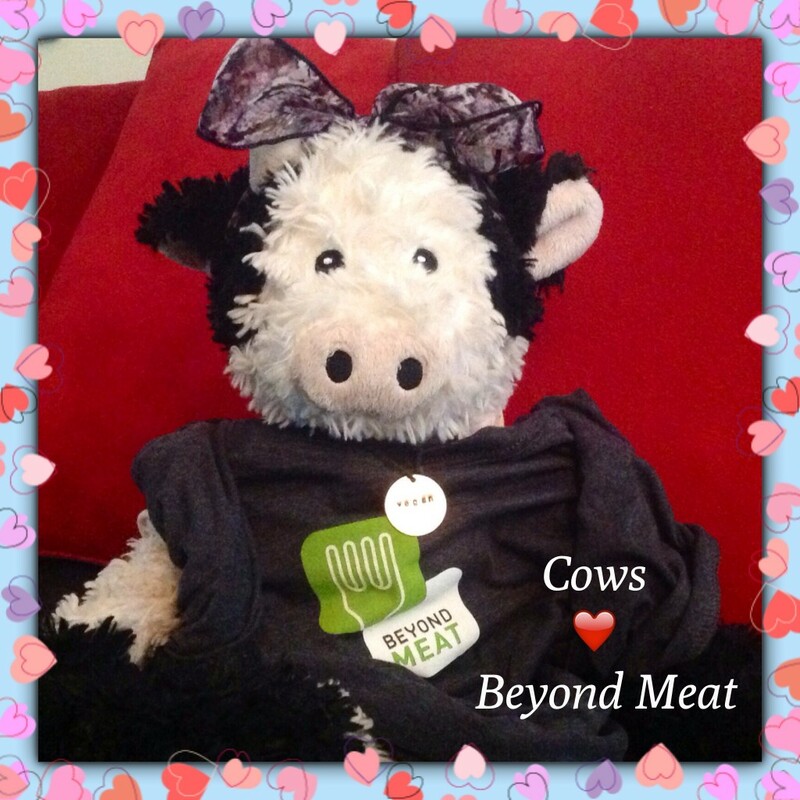 Trudy, The “V” Word’s Spokescow, proudly wears her Beyond Meat t-shirt. She’s a big fan of any company that leaves cows alone! 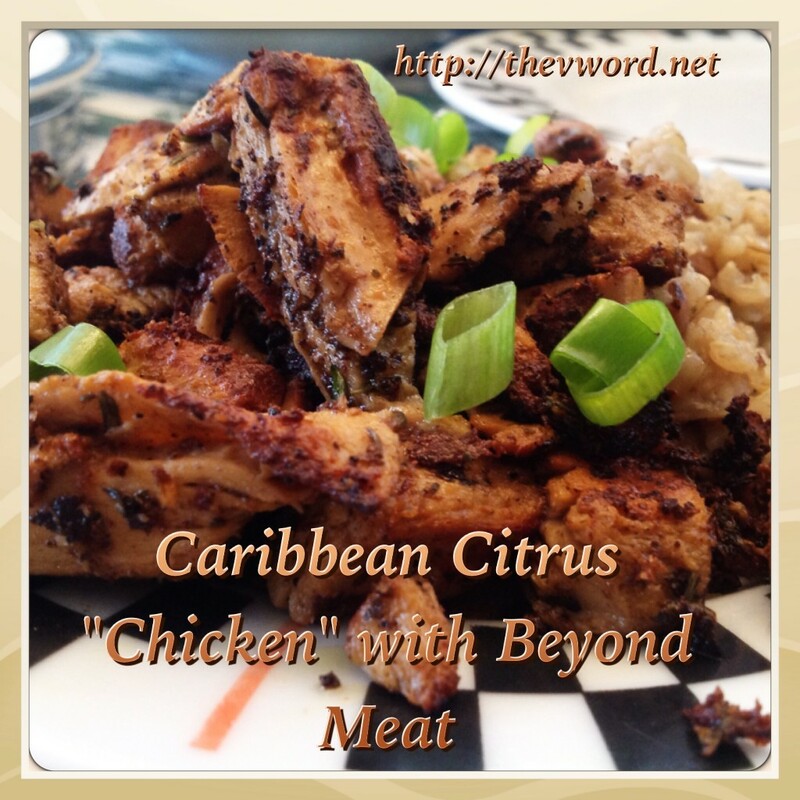 If you haven’t tried Beyond Meat, try it now and then try making my Caribbean Citrus “Chicken” or any of my other recipes with it. Enjoy! Thank you, Beyond Meat, for all the delicious meat-free meals that I love (and Trudy too)! 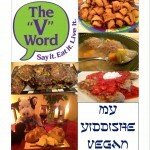 Be sure to check out The “V” Word every day this month for another vegan product I love during this month of VeganMoFo! 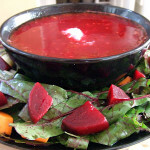 For the marinade: In a large bowl, combine the orange zest and juice, lime zest and juice, olive oil, tamari, hot sauce, ginger, garlic and herbs. Mix well to combine. 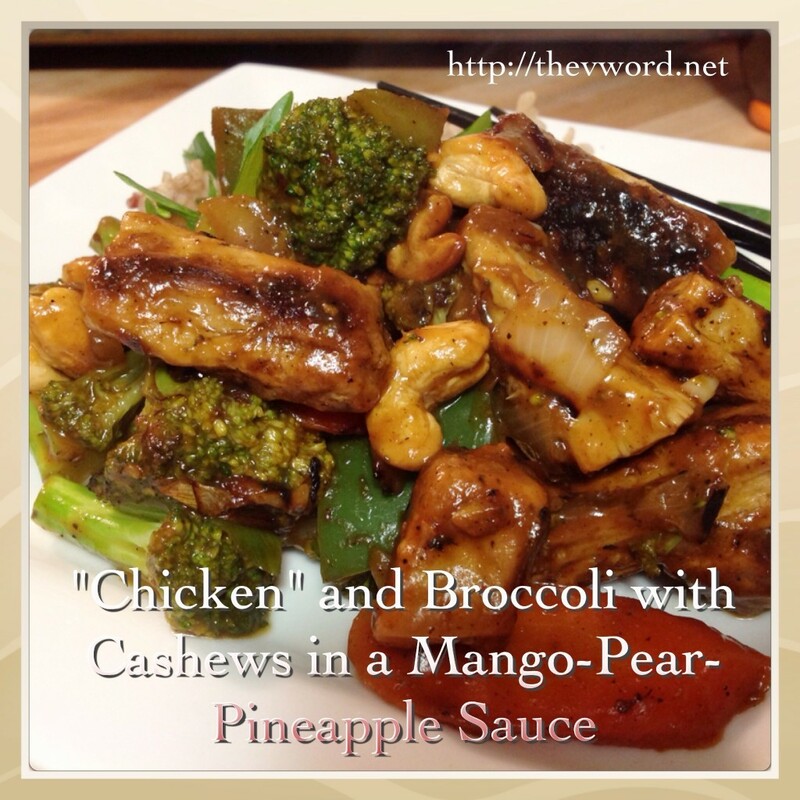 Add the Beyond Meat Chicken-Free Strips or tofu to the marinade. Cover and let sit for at least 30 minutes in the refrigerator. For the Citrus “Chicken”: In a skillet, heat the coconut oil over medium-high heat. Remove the chicken-free strips from the marinade with tongs and set on a plate. Pat them dry with a paper towel and then add them to the skillet. 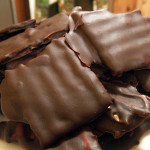 Cook the strips, turning them once or twice, until they are browned on both sides, about 5 or 6 minutes. 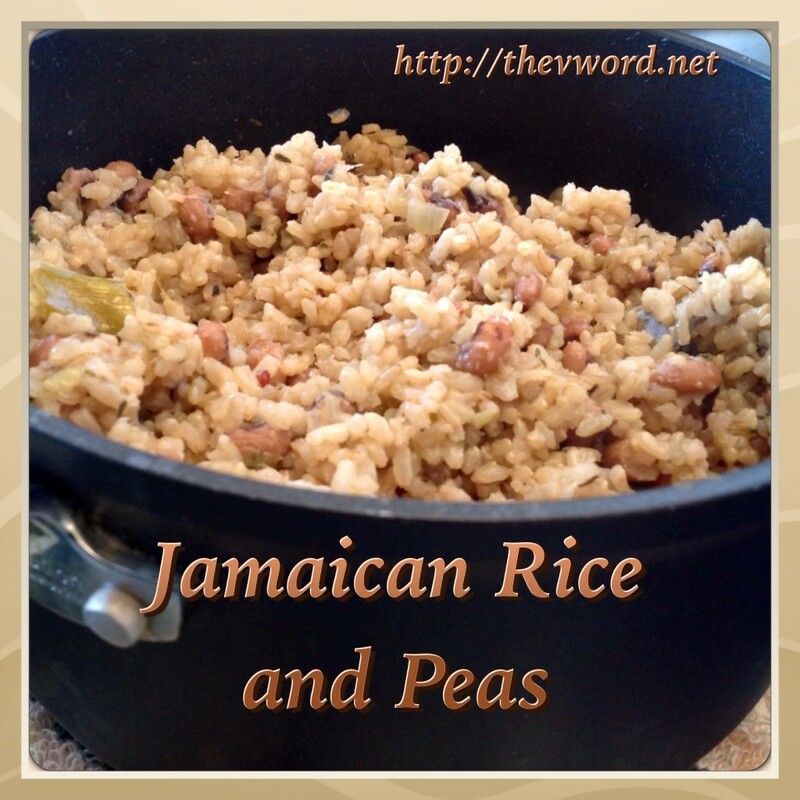 Garnish with scallions and serve with rice and peas. 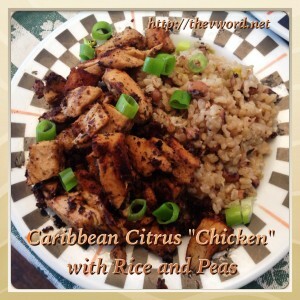 I just made this Beyond Meat & Caribbean Citrus “Chicken” and it is soooooooooo delicious!! Thank you!! 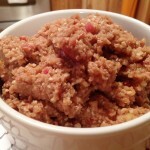 Thanks for putting this recipe roundup together Rhea! That Caribbean Jerk Chicken looks and sounds AMAZING!